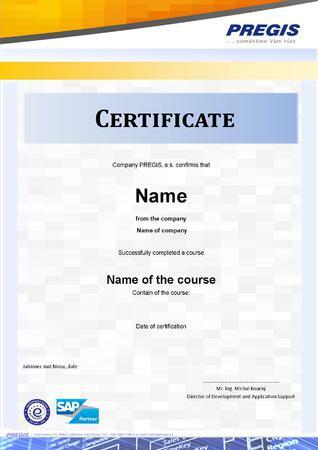 Training and Workshops | PREGIS, a.s.
Have you been using the SAP ERP and you need a further training for existing or newly implemented SAP components? Do you plan to deploy the SAP system in roll-out form and you need detailed features overview for each module? Do you prepare SAP implementation or is it already in progress? You will certainly make use of training at Pregis Academy. Training is leaded by experienced senior consultants as one- or several-days workshops with detailed agenda. Training costs includes drafting and submitting training documentation, preparation of training environment with the system, and classroom with adequate capacity (max. 10 participants). Training includes a detailed presentation and concrete examples of work with individual functional modules of the SAP ERP or the mySAP Business Suite components based on specific customer´s needs, such as: HR, FI, CO, IM, AM, PP, MM, SD, QM, PM, DMS, BIW. We will prepare you tailor-made training. During the workshops we make comprehensive analysis of your IS SAP use by common everyday working activities together with your users, recommend you potential most effective use of the SAP ERP possibilities, and will train your staff for your processes we jointly define potential improvements. In the SAP Basic course the trainees gain a necessary knowledge for basic orientation in the SAP system, learn to set up user´s accounts and work with their permission, learn about the allocation of licenses, setting a user´s options and possibilities of background tasks. Training is focused on register of suppliers, customers and the relationships between them. The participant will learn how to work with data from the available statistics. Familiarty with working with sales documents, founding partners, activities, opportunities, and their interrelationships. From a marketing perspective the participant use gained skills to lead and plan campaigns, or assigning of marketing attributes. In the field of authorization gets the participant knowledge about the base setting of profiles, learn to assign special permissions roles, transport chosen privileges and work with authorization features. Graduates are well orientated in the user´s information system. Training is thematically divided into a three selectable blocks - Quality Control, Production and Project Management. The participant will gain knowledge in the field of quality control, control batches managing or dealing with irregularities and complaints. Graduates of PS module are familiared with the complete agenda of management and maintenance the projects. The production block is mainly focused on the complete agenda of master data, operational planning, production management in terms of process, discrete and serial production. Of course there is continuous reporting and evaluation of planning. Participant of the training will meet an issues of warehouse management, acquire knowledge about warehouse agenda - generating and confirmation of warehouse orders, cancellations. Participant learns to work with reports and statements of warehouse management. The training is also focused on knowledge about Inventory Management. During the training in SAP BW is very important the role that the participant will hold at work in SAP BW. View of a training is therefore necessary to target on regular users, developers, consultants or administrators. Graduates of training will learn consolidation, modification, aggregation and interpretation of data from all sectors of company. Training in Finance and Assets is divided into a six elective blocks. The participant obtains a broad knowledge about - Financial Accounting, Controlling, Asset Management, Cash Management and Investment Management. If you are using our solutions "Asset Inventory using bare codes", we are offering special training for this area. Graduates will be able to work independently in the user interface, control the periodic and intermittent activities, reports and the complete agenda of the area. Training is divided according to two perspectives - HR and accounting. Graduates acquire knowledge about master records management, HR planning, or personnel measures. The participant is able to read reports and work with them. Training of ABAP programming language is divided into 10 thematic units. Each block contains a general introduction of the topic, followed by a detailed presentation of the activities associated with a particular circuit. Depending on the selected topics the graduate has the knowledge of object programming, data export from SAP to the MS Excel or customer optimization functionalities. Alternatively you can arrange a training sessions as a teleconference. Are you interested in our training? Contact us. I agree with the processing of personal data in order to handle a business opportunity. (required) I'm interested in sending news and marketing messages from PREGIS, a.s.